Better policies and more equitable outcomes result when data informs policymaking. In New York City, advocates used data to highlight urgent transit needs and built out the transit system to meet these needs. 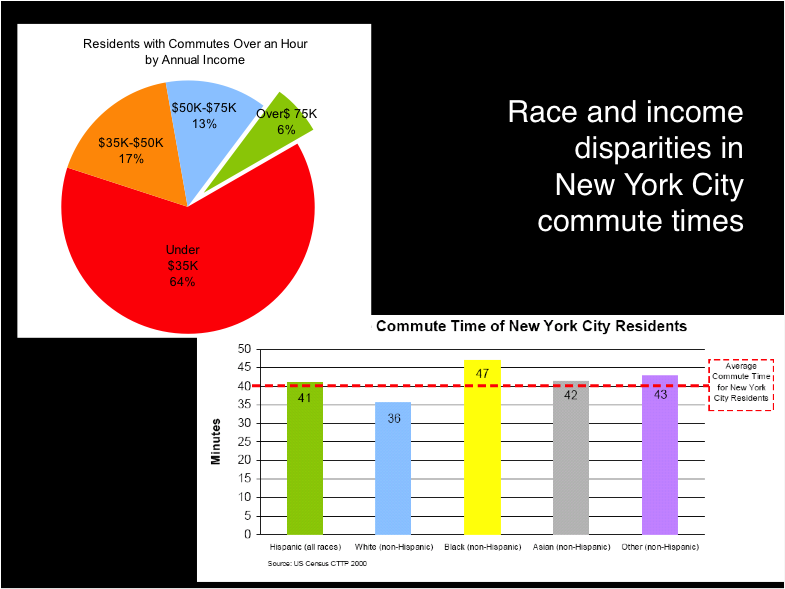 Maps and charts compiled into a Transportation Equity Atlas provided power visuals of the racial and economic inequities in the city’s transit system. Advocates could then point out where transit routes could be placed to better serve low-income communities and communities of color. This data gave policy makers the information they needed to make the transit system more equitable. The Pratt Center for Community Development has been working on transportation equity since 2007. New York City has a widely developed public transportation system and the Pratt Center wanted to see how well it was serving all New Yorkers. To do so, the Center developed a Transportation Equity Atlas with maps illustrating where people lived and worked to understand commuting patters of 289,000 residents in 13 predominately low- and moderate income communities in Manhattan, Queens, Brooklyn, and the Bronx, as well as nearly 300,000 workers at major job centers. Through this analysis, the researchers found substantial disparities in transportation access between higher-income, professional workers and low-wage manual and service workers. The Atlas showed that over 750,000 New Yorkers traveled more than 60 minutes each way to work and two-thirds of these commuters were from households that earn less than $35,000 per year. Workers or color were also more likely to have longer commute times. The Pratt Center and its partners in the coalition Communities United for Transportation Equity (COMMUTE) began to explore whether Bus Rapid Transit could improve transit options and reduce commuting times for underserved communities. Together, they created a vision for a citywide Bus Rapid Transit Network that would collect fares before riders boarded, have dedicated street lanes, and receive priority at traffic signals to allow the buses to quickly connect underserved neighborhoods and workplaces. 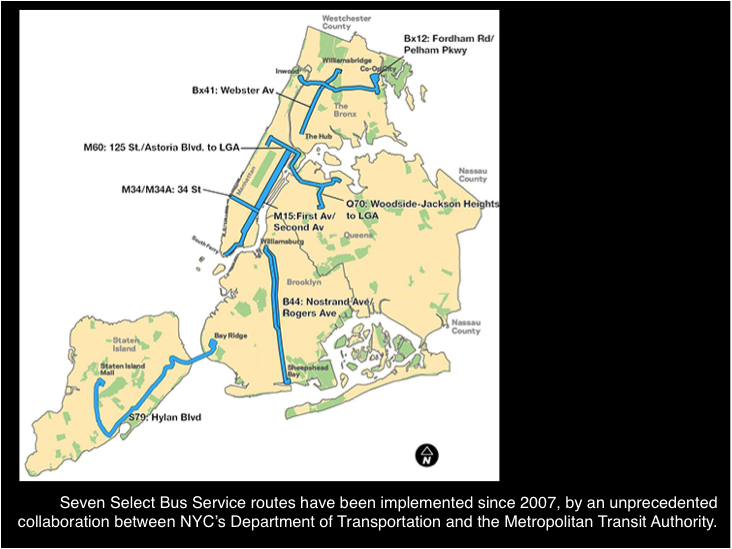 The coalition’s vision became a reality when the city’s transit departments launched the Select Bus Service (SBS) program that incorporated key Bus Rapid Transit features in 2008. The Phase 2 study from the transit agencies adopted the Pratt Center transit equity approach and looked at underserved areas and difficult connections to identify priority transit corridors. As the map below shows, seven SBS routes have been implemented providing substantial reductions in travel times and improved reliability to low-wage residents and communities. The data in the Transportation Equity Atlas combined with the data presented in the Bus Rapid Transit vision has helped decision makers and advocates work together to improve transit access for workers across the five boroughs. They are now working toward an even more expensive Bus Rapid Transit system. Byron said, “As they (the transit agencies) have moved forward on the Bus Rapid Transit routes, they have engaged in a real process with stakeholders down the corridor. The agencies have really learned to work with communities.” The result is a transit system that is more accessible and responsive to all New Yorkers, regardless of race or income.